Earlier this week Harry’s Place reported on the recent meeting between President Obama and the Speaker of the Iraqi Council of Representatives, which was attended by a leading Muslim Brotherhood figure in Britain – Anas al-Tikriti. One thing missing from the analysis was the extent to which the Muslim Brotherhood, via al-Tikiriti’s Cordoba Foundation, has been seeking to pursue its politico-religious objectives in the United Kingdom, developing support and influence on the political left. The GMBDW broke the story last week on the Obama meeting that included Anas Altikriti. Anas Al-Tikriti is the son of Osama Al-Tikriti, one of the leaders of the Iraqi Islamic Party representing the Muslim Brotherhood in that country. 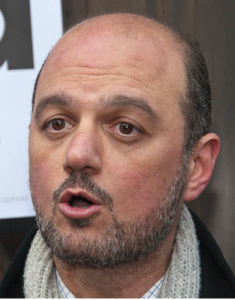 In addition to his role at Cordoba, Al-Tikriti is one of the leaders of the British Muslim Initiative (BMI), part of the U.K. Muslim Brotherhood. The Muslim Association of Britain (MAB) had for many years been the most active organization in the U.K Muslim Brotherhood but many of the leaders of the MAB left in 2007 to form the BMI. According to an Israeli think-tank report, the breakup appeared to be the result of a conflict between traditionalists in the MAB who were unhappy with the high level of involvement in U.K left-wing politics while those who who formed the BMI wished such activity to continue.